I am wearing another striped look today. I picked up this sweater last year at H&M for a bargain deal. I am so glad I did because it has been the perfect sweater this spring - and I get compliments on it when I wear it - which always makes me feel good. Also, I picked up this bag during a price matching sale at Nordstrom. If you have never shopped price matching sale - it is a great time to find great deals on items that are typically not marked down. Just type "Price Matched" into the search field on the site and it will bring back all the sale items. Your striped sweater is so cute! I really need to start shopping at H&M! Thank you fro the linkup! H&M has a lot of stripe shirts in stock and a lot of them are reasonable priced. I love your H&M shirt and your entire look! Thanks for the heads up about price matched! Such a classic, simple outfit. 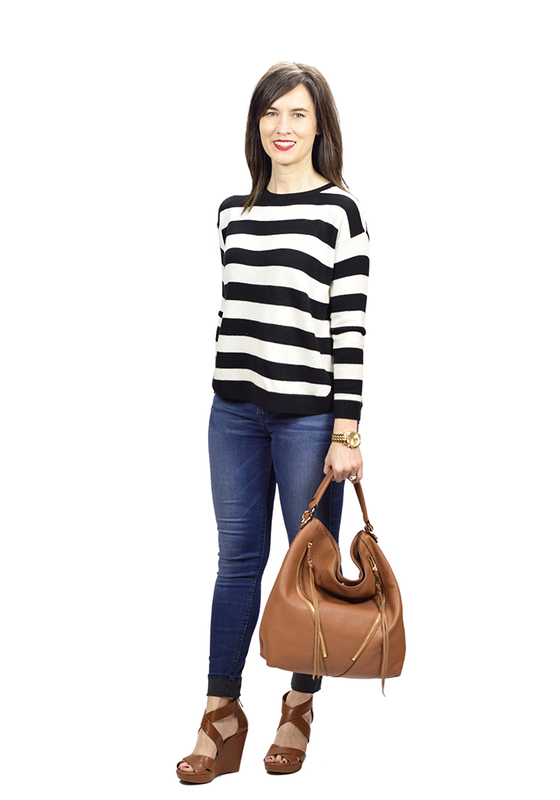 I love this striped sweater paired with the cognac wedges! Striped tops must be on the brain for today---that's what I'm wearing in my post---ha ha! OH I love that purse! I have been looking for a purse that color for a couple years now, I just haven't found anything at a reasonable price yet...but I haven't looked all that hard. That sweater too, I'm a big sucker for stripes! such a pretty striped sweater. I loved the way you styled it, so chic! Such a gorgeous sweater, I almost got one like it at Target and now wish I had. Thanks for hosting! Stripes are such a staple in my wardrobe! And cognac accessories. So basically I love this outfit! H&M has some great items, don't they? 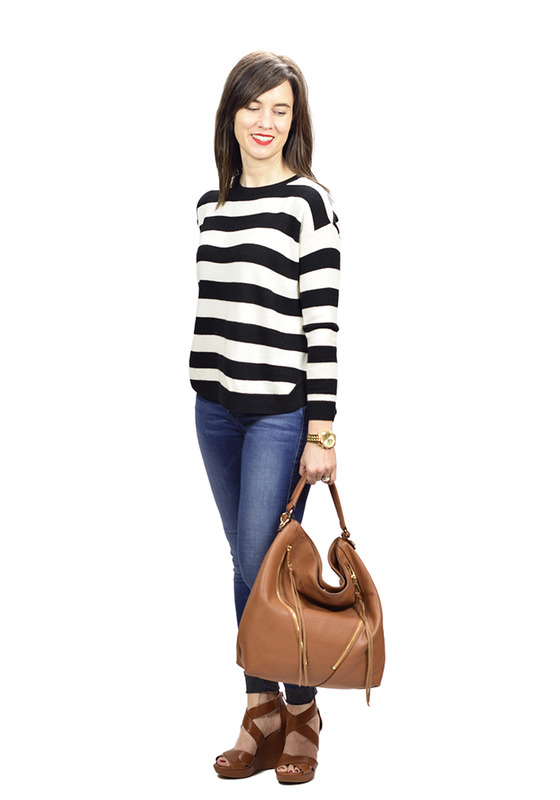 This striped sweater looks great on you and I love your wedges! 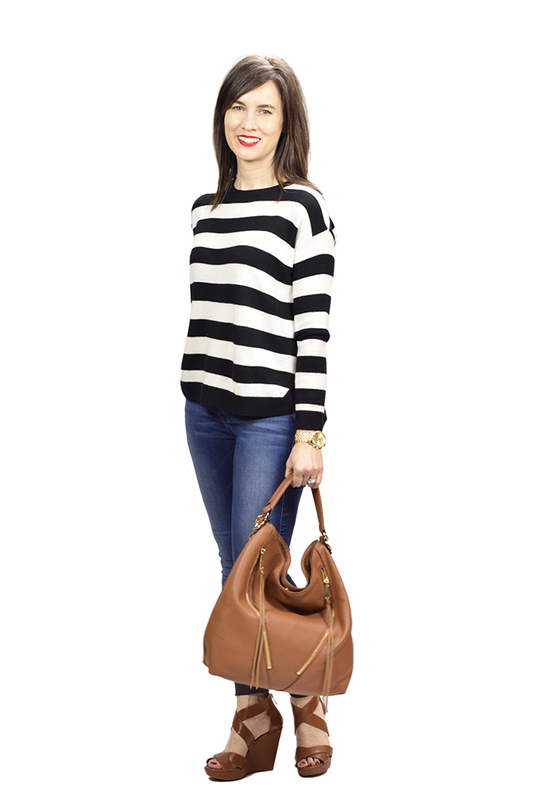 Love the stripes and cognac paired together! I can see why you get compliments on the sweater! It's adorable! ok genius way to find price matched items at Nordstrom! I would have never thought to do that! Love your striped sweater!! Thanks for hosting this great link up! I love stripes too! I chose a stripey dress as today's outfit! 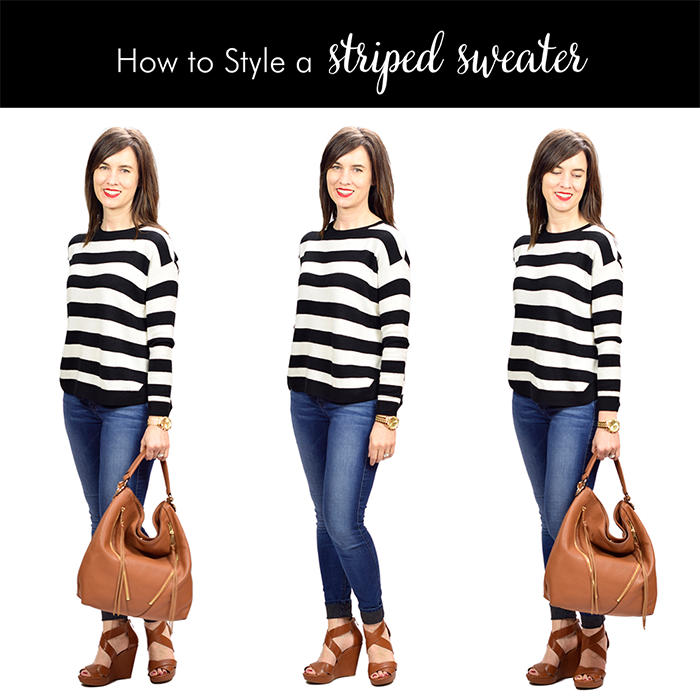 I have a very similar stripe sweater that I love to wear too. Love your RM purse! Perfect look for summer! so comfy! Perfect combo! I love the heels!! 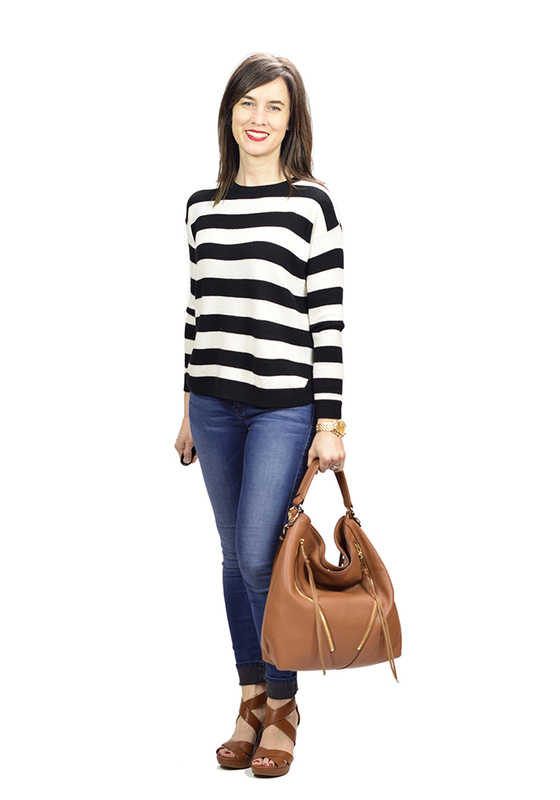 That striped sweater is great but the fit on those jeans is crazy-good! Wow, wow, wow! So cute! Loving the stripes and that gorgeous bag!